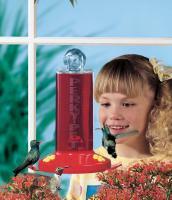 The Perky Pet window feeder is an absolute delight to behold-- a feeder that really lets you observe your favorite bird friends up close! 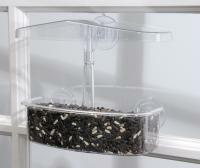 Get front-row seats to the bird bonanza every day of the year with this suction-cup window mounted crystal-clear feeder. 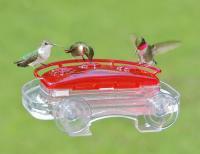 With a 1-cup capacity, you can attract birds instantly right where you can see them. Durable, easy to fill and clean, and attaches to any window surface. Perfect for children, the crystal-clear window feeder will allow little kids the privileged seat that they could only otherwise get with binoculars. Includes a one year warranty. My Mom is 89 years old and a stroke victim. We have her in an assisted living home and she loves birds. For her Birthday in February, we ordered the window feeder and put it on her window right next to her bed and she wakes up excited to see HER birds! It took 2 weeks for the birds to find it, but now there is almost always a little guy inside her feeder! THANK YOU..it makes her day and we could not ask for more. It took the birds a couple of weeks to feel comfortable to eat out of these feeders. I applied some vaseline to the suction cups so they would stick to the windows better. Worked great. I really like watching the finches from my dining table. 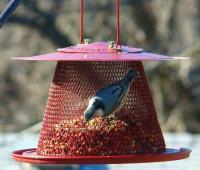 The birds love the feeder and we are enjoying watching the feeding frenzy! This is really cute and does the trick for feeding little birds. It is great to watch them eat! This is great for children! They can really get a close up look at the bird feeding. I love it! I can get a "birds eye view" of the birds. The little birds love it! They come right up to the window to eat. They get right inside the feeder and out of the wind and rain. The big birds have to eat at the other feeders, so this one is just right for the little ones. They don't even leave while you wash the dishes. It is easy to fill and clean. 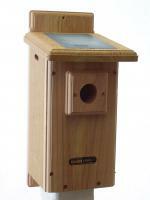 It has a nice shape which accommodates a good variety of birds. Mother is enjoying the feeder! Originally when I opened the box I didn't think much of it but I put it up in our kitchen window and sure enough the birds found it and they love it! We like watching the birds, so, we are happy with the bird feeder window and we give it five stars! I have several window feeders. This one is the easiest to refill. The birds seem to like it best also and empty it the quickest. I bought this feeder to have at work. The birds really like it. The only extra thing I wish it had would be perches. Sometimes the birds can't figure out how to get at the birdseed & so they fly right into it. It seems like having a perch would help them. My office mate & I love it & so do the other people who stop by our office! We've seen chickadees, cardinals, wrens, goldfinches & more! My husband and I love it. I was going to wait for winter to put it on my window but the birds are waiting for me to put he feeder out every morning. I decided not to make them wait for the big feeder and put this little one on the window. It is so cute to see them us it. Up close and personal. Love it and will order another one soon. This window feeder is extremely light and yet seems to be quite robust. The birds are happy to use it and from my viewpoint it is lovely to see the birds so clearly. Great bird feeder! It's wonderful to be able to see the birds up close! They love it too! It's hanging outside my window and I am excited to have more birds! It works well. The only challenge is (with all bird feeders) keeping the squirrels away. The birds really loved it, and came in droves. Unfortunately , so did squirrels, who devised a risky plan which took several days to execute. Soon they found a way to hang from my roof and latch the feeder on their way down- then their weight would pull it off the window. So I'm getting something a little more enclosed. I was disappointed with the size of the bird feeder, although I have had birds come to feed. They don't seem to mind the size. A handsome, well-designed window feeder which doesn't obstruct the view. One problem is that when birds approach and I am in the room, they veer away. They can see people and animals moving and don't feed. When I'm away, they feed very well, but that defeats the purpose of having a window feeder. I love the concept of it. I had it on a window for approx 2 weeks and never had a bird show interest in it. Also it keeps falling down - the suctions do not hold. If there is a trick to making them stay up I'd love to know it. Very cheaply made, it fell off the window and broke in half. I was very disappointed with this bird feeder. I had one before and it was much sturdier. I will not buy it again. 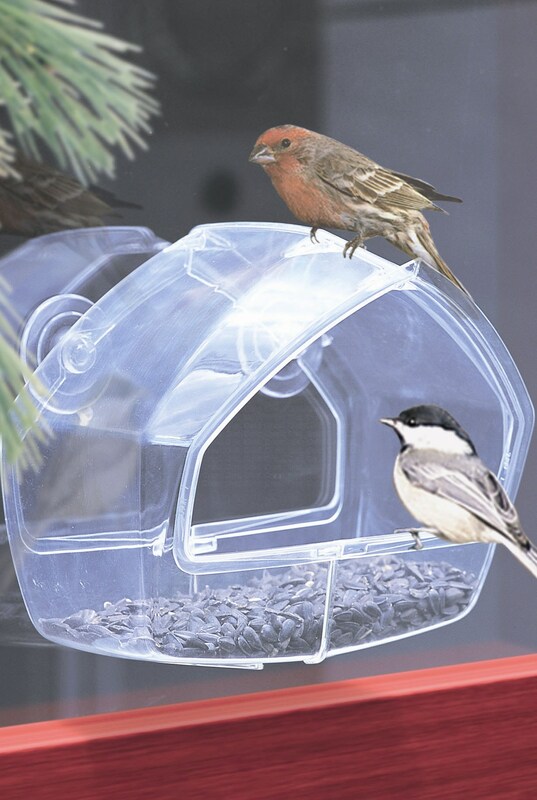 I purchased the Perky Pet clear wild bird feeder with suction cups on June 8th, as soon as it arrived I placed on kitchen window. It is July 24th and I have yet to see a bird eat from it. I say- Dude!! We have another feeder not even 10 ft from this window and live on a creek, lots of bird activity in the area of my yard. When I put bird feed out the birds go nuts. I even set out another feeder to lead the birds over to make sure they could see it on the window. Nothing. I saw this on my neighbors window and loved the idea so I ordered it. But now that I think about it I have never seen a bird in neighbors feeder either. I guess I should have asked her.